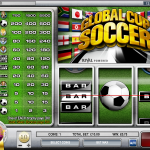 Global Cup Soccer is a 3 reel / 1 payline slot game released in 2010. If you didn’t get it (and there’s no way you couldn’t have) the theme here is based on the Soccer World-Cup. So this is actually kind of a must for all of you soccer fans and let’s face it there are so many of us out there. There is one scatter in this game and it is the Soccer Ball symbol. Landing 1 or 2 on the payline will get you 2x or 5x of your bet. Also 3 mixed trophies will win you 10x on your bet and mixed bars will win a nice 5x. 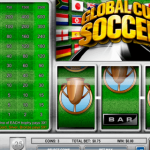 Global Cup soccer is a pretty fun 3 reel slot game that manages to deliver the fun of soccer in a nice classic slot game. It’s a pretty simple game that all of you lovers of classic slots would love. If you really care about the environment maybe you should consider playing Flea Market a 3 reel slot by Rival.